File based distribution and broadcasting provides non-traditional approach to traditional video and audio broadcast applications. The move to an asynchronous transfer of content and playout is a big departure for an industry built around distributing linear programming via satellite. A file based broadcasting model brings efficient use of bandwidth and streamlined downlink operations, which leads to greater programming flexibility and significant cost savings. There are many benefits to file based broadcasting, but adopting this type of business model requires a commitment to a new way of thinking. It’s not just about delivery at the network level file based broadcasting also affects how content is played at the local level. Program elements are distributed to each location, then played (and replayed) as needed. The file based design of the model is critical to its success. One of the most dramatic changes broadcasters will notice immediately with file based broadcasting is a significant reduction of bandwidth requirements. In a linear based distribution model, repetitive content means repetitive transmission of that content. Every time a particular movie or program episode is aired or each time a song is played in a programming block, it has to be redistributed. Consider a television broadcaster that fills a 24-hour daily schedule with repetitive hour or two hour blocks of programming. If those program blocks are simply identical to the original program block or they are scheduled to match different time zones, the network is essentially paying to retransmit multiple hours of content every day. They also miss out on additional regional marketing opportunities. Another example of wasted bandwidth is a radio network that plays top 40 hits. If the hottest hit of the week is a four-minute song programmed to play every 90 minutes or so, that means the same song is replayed about 16 times a day. That’s more than an hour of transmission time each day – and more than seven hours that week to play the same four minute song at different times throughout the on-air schedule. By adopting a file based broadcasting model, there is no longer a need to redistribute repetitive content. The distribution model builds on satellite network control systems to allow operators to both pre-position repetitive content at each downlink and send commands for playout when required. To do this, each affiliate is equipped with a device that combines “satellite receiver” and media server functionality. The model takes advantage of a network control system ability to command a group of receivers. Expanding the ability to manipulate an affiliate database to create multiple groups or sub-sets of receivers enables operators to setup the delivery of playlists, regional advertisements or targeted programming to specific receivers. Then, using playlists, operators control what content is played, in what order, and at what time. When you consider the amount of content that is repeated on quarterly or annual basis, it’s easy to see how quickly a file-based approach can save on transmission costs. Another reduction in bandwidth requirements comes from transmitting some, or all, programming content in non-realtime. Content is now just a data transfer of a file that will be broadcast at a later time. As a result, it can be distributed at non-peak times or trickle fed, which can shave off even more transmission costs an important consideration particularly for video broadcasters, as the demand for bandwidth-hungry high definition content continues to increase. File based broadcasting naturally extends from production, where file-based workflows are currently replacing tape-based environments. A central network operator can efficiently move finished media content into the distribution pipe and manage targeted delivery to multiple sites. It opens the door for the use of more custom programming, regional advertising and, in the case of radio, custom radio announcements and station callouts. Combining content collection and playout functionality for all national and localized content into one box at an affiliate sites reduces operational complexity and improves production scheduling capabilities at the network level. Of course, it might not be feasible for an entire network to discard all of its existing hardware at each affiliate, backward compatibility is possible to ease the transition. New file based broadcasting solutions are designed to work with existing local ad servers and to cue local devices. File based broadcasting also does not mean the end of local or live programming. In fact, it fully supports the blending of live and file-based content at the local level. For example, the new technology can provide automatic time zone shifting allowing network affiliates to record a live program feed, but automatically play it out at the correct time several hours later. An additional benefit is the ability to offer new loss of signal (LOS) strategies to affiliates. A network can save consumers from experiencing dead air by utilizing the receiver/server’s ability to automatically switch to locally stored content during a period a live feed is not available, either due to signal loss or encryption. The network can regularly update this LOS content and associated playlist to keep it timely and, even locally, relevant. File-based broadcasting can also improve productivity in teleports and digital satellite news gathering (DSNG) applications. For teleports, file-based broadcasting streamlines the process of ingesting and broadcasting client material, plus it increases opportunities to help clients tailor broadcasts to their affiliates. For DSNG, decoder/server units make it easy for affiliates to receive and record live feeds for later use. Plus, feeds can be augmented with pre-packaged media assets filled with related materials (graphics, scripts, web video, archival footage, etc.) from a network to affiliates for local news coverage. The file-based distribution and broadcast model is a gateway to cost savings at the network and local levels for any video and audio broadcaster. The reduction of bandwidth usage for repetitive material can be significant, while the digital workflow can reduce operational complexity. Meanwhile, the handoff from production becomes more efficient and programming options at the network and affiliate levels more flexible. It is a logical next step for broadcasters managing video or audio, from ingest, through archive, targeted delivery, and playout. WEGENER’s file-based broadcasting solution builds on a linear satellite network to allow operators to pre-position repetitive content at each downlink and control later playout, while mixing in live broadcasting segments. The solution includes a range of devices that combine satellite receiver with media server functionality called iPump® media servers and the corresponding network control products to manage distribution and digital assets. Each iPump model features an integrated satellite receiver decoder that allows it to record or playout live streams and IP encapsulated files. It can also connect to a local area network for non-realtime file delivery, control and monitoring. 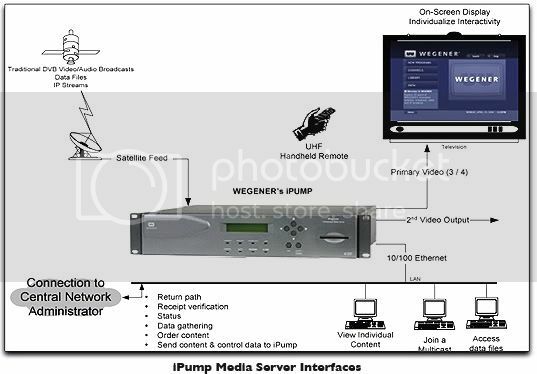 The WEGENER video iPump media servers handle MPEG-2 and MPEG-4 video files for commercial broadcasters or private networks, while the WEGENER audio iPump media server is specifically designed to support regionalized affiliate radio broadcasts.